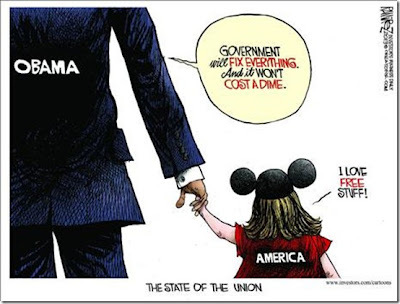 During the excitement of Obama's State Of The Union this week, where he promised unlimited prosperity financed by the government, he mentioned one of the new strategies he plans to put in place to "help" our economy grow: raising the minimum wage. Raising the minimum wage is a topic I have discussed on the past, but it is good to review again this week with it back in the spotlight. A quick discussion involving basic, real world, economics will show that raising the minimum wage only hurts the workforce as a whole. The current minimum wage structure pays $14,500 per year. An employer has costs above and beyond that to pay taxes and insurance (there may additional costs if they offer benefits). These costs can vary widely depending on where you live but we'll say an estimated total cost for this minimum wage employee is $18,125 per year. An increase in the minimum wage to $9 per hour would bring the employee's total pay up to $18,000 per year and bring the total cost to the employer up to $22,500. Most of the jobs that will be impacted by this decision are in small business (where the majority of the jobs in the United States are created). An owner of a small business may perhaps have the ability, based on current sales and expenses, to staff 4 full time minimum wage workers for a total cost of $72,500 per year. What if the total cost of these 4 workers were to rise to $90,000 with the increased minimum wage? One option would be to move all 4 workers down to part time (the most likely strategy based on the devastating costs Obamacare will heap on to businesses employing full time workers), or it will lead to 1 of the 4 workers losing their job completely. That worker will now make $0 per hour. Obama thinks that all the ruthless large corporations that are sitting on large piles of cash can afford to pay a little more for the hard working people of America, and he is right, they can. The problem is that is not where those jobs are created. In the real world, a world the President has never worked or lived, a rise in the minimum wage will be devastating. Why not just raise the minimum wage to $12 an hour, or $15, or $20? Under Obama's economic views, would that not just help the economy even more? The truth is that the best way to help the working class is to make it more desirable for businesses to hire them: lower taxes and less regulation, but it is far easier to try and "punish" those greedy companies that actually put people to work.